. :: biotica studio | laboratory ::. "Biomimetics: Emulation and Propagation in Post-traditional Ecologies"
Pre-print of “Biomimetics: Emulation and Propagation in Post-traditional Ecologies", in “Second Nature: Reproduction and the Artificial in Art, Science and New Media”, Rolf Hughes & Jenny Sunden, Editors, KTH, Royal Institute of Technology, Stockholm, Sweden is available for download as PDF HERE.
.:: A B S T R A C T ::. The strategy of applied biomimetics has been heralded as design innovation inspired by nature. The inclusive process takes in phases of bioprospecting, biophilia, and emulated biosemiotics to arrive at an implementation of engineered design that ideally might carry implicit biological/environmental sensibilities. Applied elements from this strategy can be found in cybernetics, therapeutics/medicine, structural engineering, militarized intelligence and now in the propagation of new media art practices. While the idealized practice emulates a platform of honoring/sustaining the original thru the preservation of context, the extended practice in post-traditional ecologies frequently crosses the lines of biopiracy and sustains a distancing spiral of simulacra thru a re-wiring of ecological consciousness. This essay examines the intent and impact of applied biomimetics across a spectrum of creative and technological-mediated processes through three comparative lenses: as the scientific characterization of natural biological systems; as historically-rooted sociocultural performances/practices and as contemporary engineered-design and creative media-based expression. The objective of comparison through these three perspectives on the biomimetic approach to the appropriation and emulation of natural systems is to align the phenomena and practice within the contextual realms of traditional and post-traditional ecologies as a means of characterizing the distance between origin and derivative in this creative biocultural practice. 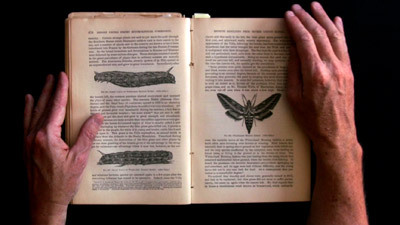 "ArthropodaChordataConiferophyta" is a work of afterlife cinema that seeks to reanimate the residues, record and archives of lost ecological memory. The performance-based work follows the intertwined cycles of life to the afterlife through interactive cinema as sensorial access to complex biological, ecological and biogeographic residues across a spectrum of scales from the phylogenomic to the biospheric. The work gesturally and algorithmically explores the re-animation of the digital residues of lost and endangered lifeforms from three phyla; Arthropoda (from endangered and lost insect migrations), Chordata (from the cascaded of bird extinctions in the 19th and 20th centuries), and Coniferophyta (from the waning survival of ancient forests). The sonification and visualization of these ecoinformatic sources (including ancient DNA & protein sequences) is immersively experienced through the mixing of ambient field video from lost ecosystems and live performance through morphological drawing and electroacoustic instrumental interfaces. The hope of this project is that audience engagement will yield a vision and recollection of the complex imagined distance when ecological memory becomes lost to the circumstance of extinction. Made it back to home turf in New Mexico and Colorado with this project as it premiered at Currents 2013, the 3rd Santa Fe International New Media Festival, June 15, 2013. Then back in Boulder at MediaLive2013 at BMoCA on November 8, 2013. Excellent coverage to date w/ a fantastic review article in Pasatiempo (SFe) by Paul Weideman and a second article on AdobeAirstream by Leanne Goebel. We'll see where it goes from here. Timothy Weaver + eMAD at DAM/EMBRACE! 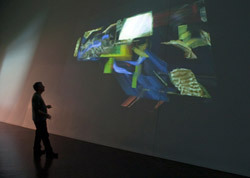 The interactive video installation 39˚ 44′ 11″ N x 104˚ 59′ 21″ W opened on November 14, 2009 as part of EMBRACE!, an international exhibition of 17 site-specific installations at the Denver Art Museum. The temporal works were commissioned as collective artist response to the architecture of the Daniel Libeskind-designed Fredrick C. Hamilton Building. 39˚ 44′ 11″ N x 104˚ 59′ 21″ W is a site-specific interactive video installation that seeks to develop a dialectic between ecological memory and architectural space and form. The work brings forward the ideals of ecological memory as the historical, cosmological and environmental ground for the evolving architectural memory of the Hamilton Building. Ecological memory is re-mediated through the interpretation of contemporary and historical data from the celestial to the terrestrial to the biotic into an immersive interactive environment that responds to audience movement and the range of interactions associated with the data interpretations of the installation. The title of the work 39˚ 44′ 11″ N x 104˚ 59′ 21″ W is based upon the latitude and longitude coordinates of the Denver Art Museum’s Fusebox Gallery. The gallery is transformed into an “observatory” site for the translation of datastreams into creative ecological memory within the Hamilton building architecture. 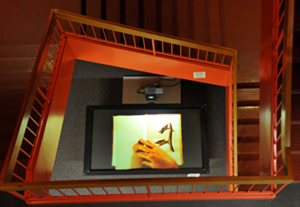 The installation project is composed of two major media elements; initially a video flatscreen triptych that acts as the prolog and epilog of the work. The audio elements of this work are composed of a Latin aria of chanted names of recent extinct organisms of the region extended by a sound bed of DNA and protein music translated from genomic and biochemical characterizations of the extinct Rocky Mountain Locust (Melanoplus spretus). This media segment is a foreshadow to the central interactive installation space. Physical audience movements in this space bring together visual and sonic bits of the lost and endangered ecologies of the site as an immersive digital cinematic experience. The interplay of sound layers in the installation space comes from audio composed from solar storm data, voice work mediated from historic climate data, and bio-acoustic sounds recorded from current organisms related to the extinct locusts and the lost bird species of the region. The resulting immersive experience visually and sonically reunites the lost residues of the former lifeforms of the region. Audience interactions are simultaneously tied to a present version of ecological memory while speculatively re-mediating the ecological ghost stories of the historical past. HYLAEA is an interactive video, print and rare book installation that seeks to reanimate the residues, record and archives of lost ecological memory. Part ecological ghost story/part zoological bibliography, this project stems from a desire to partially awaken the resting memories of lost life forms from the extinct species cabinets of the museum and the rare book shelves of the library. My intention in seeding motion, sound, interaction and macroscopic detail across the library is for viewers to recall that within less than a century of the publication of the first written and painted records of the astounding bird life of North America, both common and mythological species became the icons of human-induced extinctions. The HYLAEA installation project at Penrose Library is one of a series of new media works that collectively explores the language, sites, mediation and possible restoration of lost ecological memory. The series title HYLAEA refers to the mythical and now lost forests of ancient Greece and to Alexander von Humboldt’s explorations of the virgin neotropical forests of the Americas. 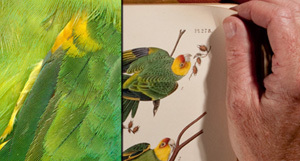 The intent of this project series is to collectively bring together disparate artifacts of lost ecological memory such as the deep colors and textures of extinct birds wings; sonic translations of the DNA and proteins of missing species; and passages from the pages of endangered books that were the original published record of the exquisite lifeforms of North America. The hope is that audience engagement with such immersive experiences may re-mediate the patterns of lost ecological memory as a means of facilitating a discourse into the state of ecological consciousness during our time of cascading extinctions. Participation in this year's FILE 2009 in Sao Paulo - FILE 10 NURBS PROTO 4KT, includes the introduction of the Tools for Life Cinema project at the FILE SYMPOSIUM 2009 and screening premiere of the biomedia video work Biological Narrative #9: manuMindo at FILE HIPERSONICA 2009. This year's FILE is the 10th year of the new media festival events in Brazil. FILE events run from July 28 - August 30, 2009 at the FIESP - Ruth Cardoso Cultural Center, 1313 Avenida Paulista in Sao Paulo. 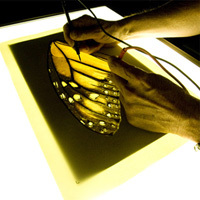 The FILE SYMPOSIUM runs from July 28-31, 2009, daily from 2 - 6:30PM in the Mezzanine of the FIESP. 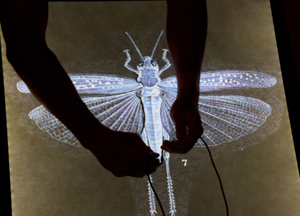 The Tools for Life Cinema project brings the experimental hybridization of digital live cinema and performative bioinformatics into the form of "life cinema." 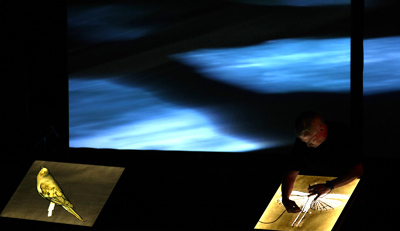 This subgenre of new media/digital cinematic performance builds upon the open-ended multimedia output of live cinema and the bending of biological computing, artificial life, ecological modeling and biomimicry to deliver sonic derivatives and visual translations of biological/environmental sensibilities into immersive new media forms.